Standard marine fabrics can cause significant problems when working with complex three-dimensional patterns and shapes. Safety Components' new WeatherMAX 3D offers the flexibility to fit almost any project. Under tension, the highly elastic fabric stretches 30–100%. When released, it goes back to its original size. Innovative WeatherMAX 3D is a high-performance outdoor technical fabric. Made from the same engineered polymer as other versions of WeatherMAX, it's 100% pigment solution-dyed for superior color consistency, durability, and has the same long-term UV and fade resistance. HydroMAX makes the fabric water-resistant, yet breathable. It is soft and pliable, and nearly impossible to tear. "WeatherMAX 3D is able to stretch and move in three axis, providing a perfect fit without requiring excessive darting to contour to a shape," said John Pierce, WeatherMAX product manager for Safety Components. "It's also a perfect fabric for shade on marine applications where it will easily stretch over an area that needs sun and rain protection." 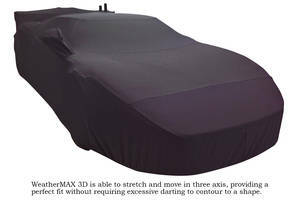 Made in the USA, WeatherMAX 3D performs in the harshest environments. It's ideal for sun shades, protective covers or any application requiring outdoor durability and elasticity. Safety Components manufactures technical fabrics for a wide range of industries. Its flagship product, WeatherMAX, is built to defeat the most grueling and extreme outdoor conditions. Contact WeatherMAX by Safety Components, 40 Emery St., Greenville, SC 29605. 864-240-2712; Fax: 864-240-5947. www.weatherMAX.com.